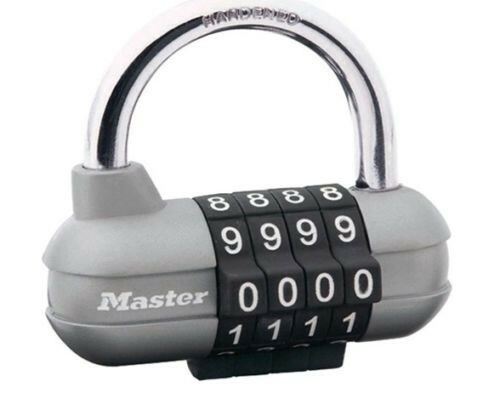 Brand New Master Lock Combination Padlock The Master Lock Pro Sport combination padlock is practical and durable leisure/lifestyle security solution with large soft touch, easy to use dials. The padlock has 4 resettable dialling wheels, allowing 10,000 possible combinations. These padlocks are not only designed to be tough, practical and durable, but to look good as well. Supplied with a Lifetime Warranty against mechanical failure. Suggested Uses: Lockers, cupboards and sports bags. Specifications: Type: 64mm die cast padlock Shackle diameter: 7mm hardened steel.